Jim Askim is a Marin County native. Jim was born and raised in Novato California. He graduated from Novato High School in 1973. He excelled in Vocational Automotive technology and went directly into the automotive work force, starting as a lot boy at the local Subaru dealer here in Marin. While there, Jim started to work his way up to Shop Foreman and then to Service Manager and Parts Manager. 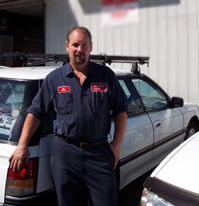 Jim has also served on the Automotive Technology Advisory Board for the College of Marin for over 12 years. Jim has a very high standard of work ethic and professionalism. He has put together a team of professionals to help him keep his business the #1 Marin Independent Subaru Service Center. The company has prospered and the Askim's Auto team is very proud of the longevity of the shop and works hard to keep it's high reputation.